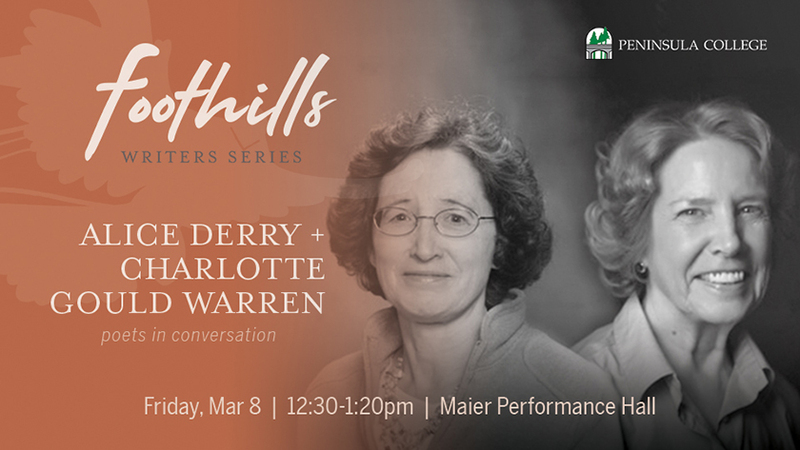 The final Winter Quarter Foothills Writers Series reading will feature “Poets in Conversation” and original works from two Peninsula poets who are longtime friends, Alice Derry and Charlotte Warren. The event is free and open to the public, and will take place Friday, March 8, at 12:30pm in Maier Performance Hall on the main campus of Peninsula College. Join us for this unique opportunity to hear poetry and reflections on the process of writing, editing, and supporting others in creativity. Alice Derry directed the Foothills Writer Series for more than 25 years, and the college is honored and delighted to welcome her back to the Foothills stage. She was the Writer in Residence for Peninsula College in 2016. Her fifth book of poetry, Hunger (MoonPath Press), appeared in 2017 and Tremolo (Red Hen Press) in 2012. Strangers to Their Courage (Louisiana State University Press) was a finalist for the Washington Book Award in 2002, and Stages of Twilight (Breitenbush Books) was chosen by Raymond Carver for the King County Arts Award in 1986. Derry retired after teaching writing, literature, and German for more than 37 years. Charlotte Gould Warren’s Dangerous Bodies was published by the Stephen F. Austin College University Press (SFA) in 2015. SFA also published her memoir, Jumna: Sacred River, which chronicles her childhood in India during its fight for independence from Great Britain and her coming of age in the United States. An earlier poetry collection, Gandhi’s Lap (Word Works) won the Washington Prize, and her poems have appeared on Seattle buses as well as in Orion, Calyx, The Hawai’i Pacific Review, The Louisville Review, and Kansas Quarterly. Warren is also a visual artist, and her drawings have appeared on the covers of each of the Reading for Hunger Relief chapbooks published by Rhymestone Press.